Slang abbreviation for mozzarella, a mild, semi-soft Italian cheese. 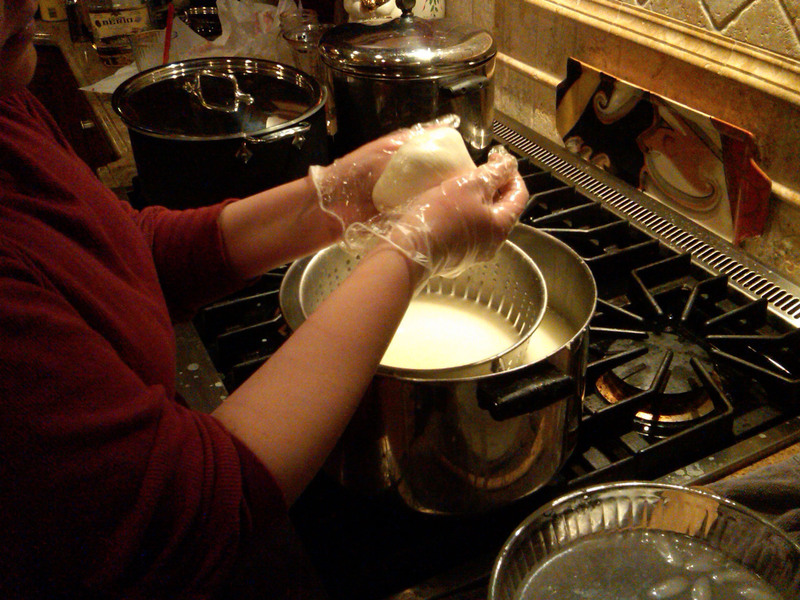 One of my favorite days in culinary school was when we learned how to make mozzarella. Putting my education to use, I volunteered to make fresh mooutz for Christmas. Below is my step-by-step tutorial photo-guide. 1. 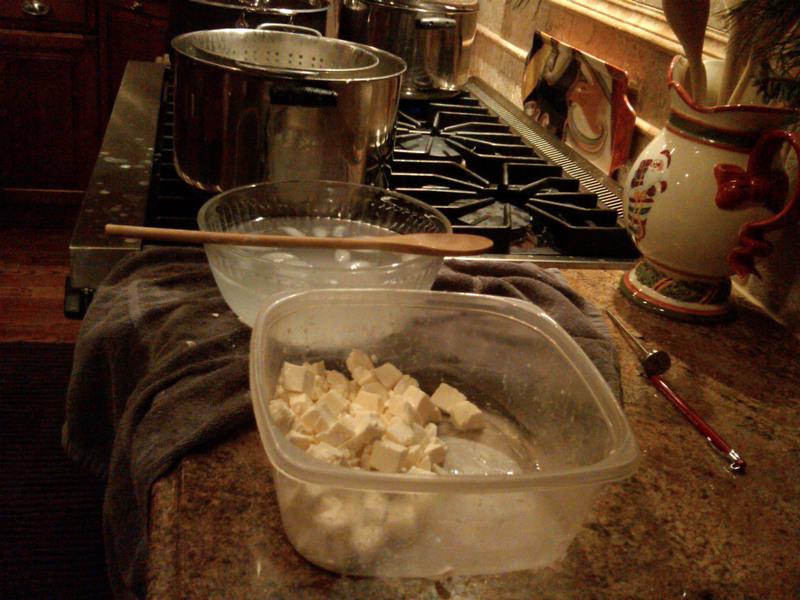 Chop the cheese curd into 1/2″ cubes. The thing with cheese curd is you usually have to know a guy, and then buy it in bulk. 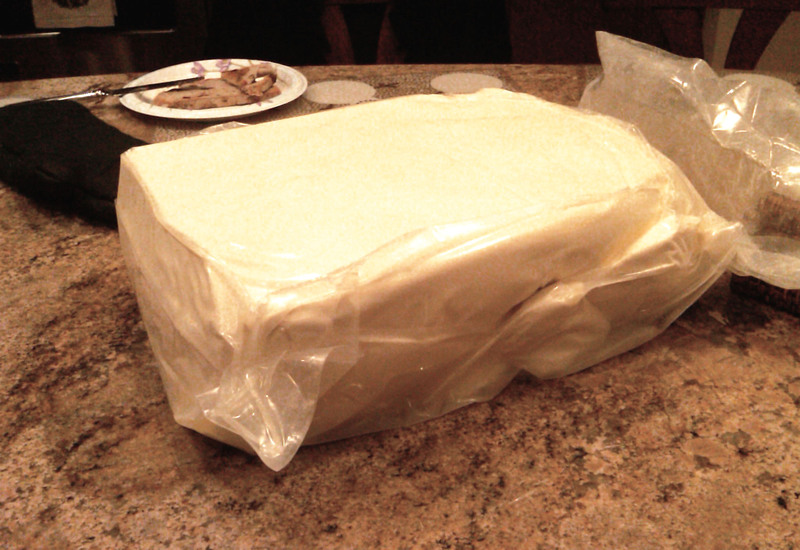 This is about 20lbs of curd. Ideally you need only about 2lbs per portion. 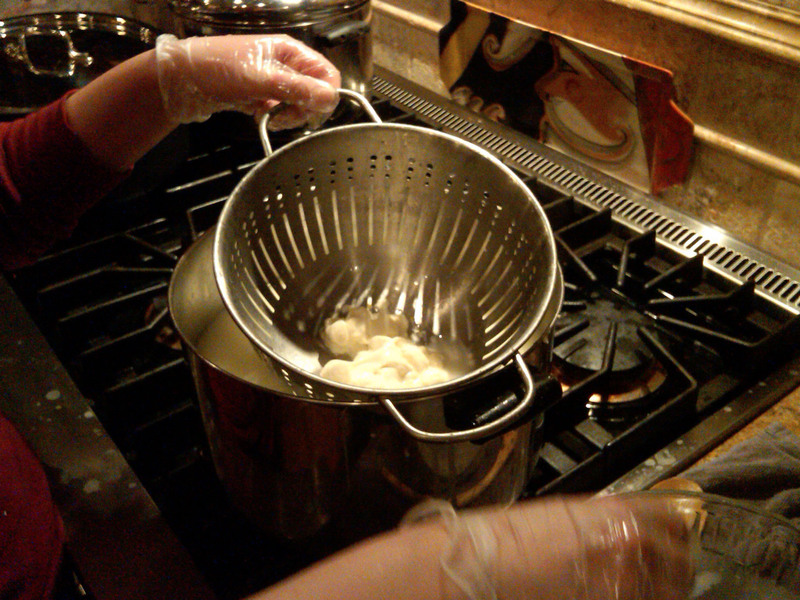 Learning how to make curd will be my next challenge. 3. Place a handful of curd into the collendar. 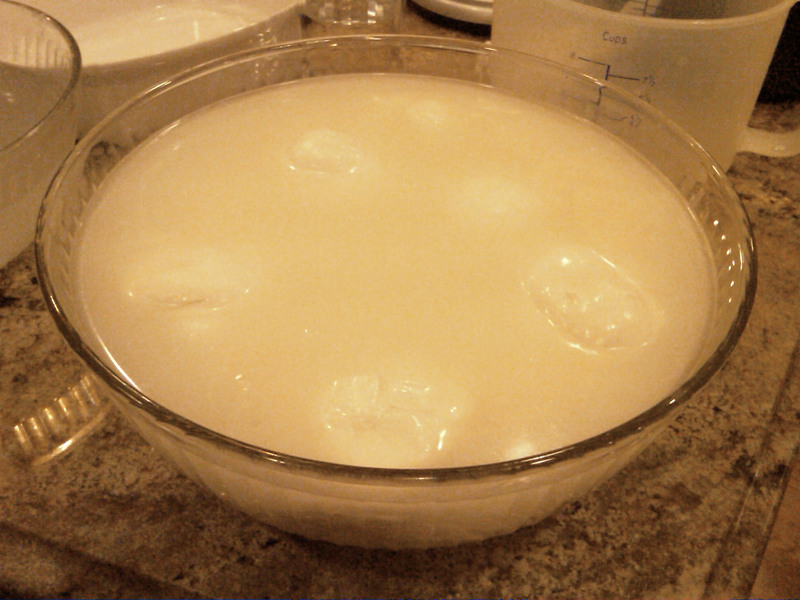 Before you do this, temper your hands in the ice water, then grab a handful of the cubed curd and put in collendar making sure the cubes are about 1/2 way submerged in water. Once they’re in the hot tub give them a stir with the spoon and temper your hands in the ice again. Make sure the water temperature doesn’t go below 160 degrees. 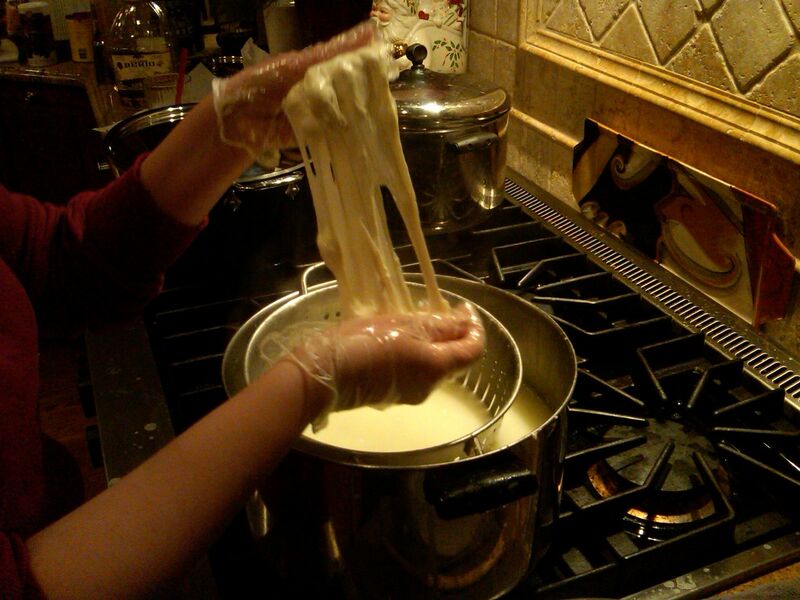 Just as the curd is beginning to soften lift up the collendar and grab the curd with both hands. It will be VERY HOT. 4. 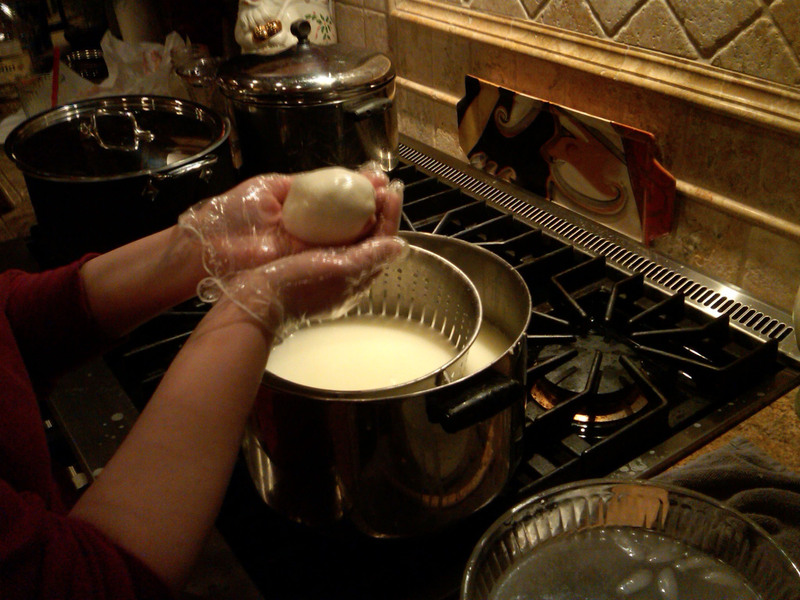 Gently create a ball and stretch the curd. Temper hands in cold water as necessary. And do not overwork the curd. 5. Begin to shape the ball. This step will take time, patience and skill. The best way to describe this process is to grab from the top and bring flaps to one point on the bottom of the ball. Use the area between your thumb and index finger to help smooth out the top. Do not try the meatball technique. 6. Place finished ball in ice water. Again, do not overwork your Michaelango here, it’s good to practice a few, you’ll get the hang of it. Store the finished mooutz in the ice water, adding a little of the water from the pot. You can also wrap the balls in plastic wrap. They will stay fresh for about a week. You’ve heard the term ‘roll out the red carpet’ well in my family it’s ‘roll out the FOOD.’ Here’s a little sampling of the Saturday night BBQ. Sausage and Peppers. Love the little baby peppers. They stay super moist when you don't cut them.